While the idea of using information and communications technologies in education (ICT4E) certainly is not new, it has received an ever-increasing amount of interest from governments, donor agencies, NGOs, and similar organizations in the past few years. One model for ICT4E interventions which has become particularly popular is the so-called “1-to-1” approach. It is constructed around the key concept of every user, in most cases pupils and teachers, having access to a personal digital device. To date most 1-to-1 initiatives have been implemented with laptops or netbooks, whereby One Laptop per Child’s XO laptop and Intel’s Classmate PC have seen particularly wide-spread adoption. However, with the increasing availability and popularity of other ICT devices such as tablets, mobile phones or e-book readers it is no longer sufficient to exclusively focus on laptop or netbook based projects in the 1-to-1 space. Within this larger context this article aims to provide an overview of 1-to-1 initiatives around the world. Or rather the goal is for this article and related data to form the basis of a crowd-sourced effort to build and maintain a curated, comprehensive, and up-to-date record of significant 1-to-1 initiatives. As such this post and the information presented in it should be a considered a starting point for further work rather than a finished and complete artifact. By highlighting key developments in other countries, which have implemented OLPC initiatives, it will also try to provide additional context for the previous EduTechDebate posts, which were largely focused on the Peru’s OLPC project. Here is the link to the underlying sheet – please add in project data and links to verifications. It must adhere to the 1-to-1 approach by distributing a personal device to each user. It must be of significant size whereby this was defined to mean that the initiative takes place in at least a state/region if not a whole country. As indicated above this overview is technology-agnostic insofar as all kinds of device-choices are considered as long as the two basic criteria are met. Most of the fields used in the overview should be self-explanatory. An exception might be the saturation column, which indicates the ratio between the number of devices that have been distributed, and the number of potential users which the initiative is aimed at. As it turns out one of the biggest challenges in the compilation of this overview was finding reliable information as opposed to mere announcements or discussions of 1-to-1 initiatives being considered or launched. Also, relevant information about initiatives might not be available in English, Spanish, French or German and hence not accessible to me. Therefore it is quite possible, in fact even likely, those sizable efforts in countries such China and Russia have been omitted from this list. Any corrections, enhancements, suggestions, and other feedback regarding this overview are much appreciated. Earlier I mentioned the notion of 1-to-1 having to be expanded to include more device categories such as tablets, mobile phones, and e-book readers. At the same time the table above reveals that as far as ongoing projects netbooks, and in particular the OLPC XO and Intel Classmate series, remain the most widely used devices in 1-to-1 projects today. While a significant number of pupils and teachers are involved in 1-to-1 projects which use netbooks, the road until 1-to-1 becomes a global reality is very long indeed. Latin America is without a doubt the global hotspot of large-scale 1-to-1 initiatives. What strikes me as interesting is that beyond the aforementioned key figures fairly little information – let alone further documentation such as accurate TOC figures or impact evaluations – is publicly available about most of these initiatives. Given the vast amounts of money which are currently spent on implementing 1-to-1 initiatives one would wish that all of them would be accompanied by extensive monitoring and evaluation efforts. Unfortunately this generally does not seem to be happening. This makes IDB’s ongoing evaluation of Peru’s Una Laptop per Niño such a noteworthy effort that deserves the attention of researchers, practitioners, policy makers, and everyone involved in 1-to-1 initiatives. I have since used these six criteria in both a descriptive fashion to support the analysis of ongoing ICT4E projects as well as a prescriptive set of aspects to consider when planning such initiatives. Therefore I believe that these criteria can also serve as a basis for extracting valuable lessons for other ICT4E projects from Una Laptop por Niño and other OLPC projects, in particular Uruguay’s Plan Ceibal. 1. Infrastructure needs of ICT4E projects are often considered but seldom seem to be addressed in their entirety. For example in Peru some schools which were formally counted as having electricity turned out to actually only have a very small number of or even just a single power outlet limited to the principal’s office. Especially with 1-to-1 projects this is obviously a serious restriction that is going to impact the potential use of devices such as netbooks, even more so when children and teachers can’t be expected to have electricity at home. Internet access or an intermediary solution such as educational resources cached on a server that receives occasional updates is another infrastructure dimension that can provide tremendous value in ICT4E projects. Beyond its potential impacts on education, connectivity also facilitates other aspects of projects. For example it makes it easier to distribute software updates and enables teachers to informally connect with each other to share experiences and resources. Last but not least such infrastructure can also provide benefits outside of the scope of ICT4E itself, e.g. by providing electricity and Internet-based services to other members of the community where it’s installed. 2. Maintenance has to be a key component of any ICT4E effort. Despite numerous improvements in its maintenance system and more than two years after Uruguay reached full saturation in its public primary school system the project recently reported approximately 46,000 pupils’ machines being out-of-service. IDB’s current report about Una Laptop por Niño also found that 13% of XO laptops have malfunctioned at some point so far. Beyond the associated significant logistical and financial burdens such widespread technical issues likely also play a role in slowing down their acceptance and subsequent classroom use by teachers. 3. Contents and materials covers a broad variety of artifacts such as electronic books, multimedia collections, educational content or software tied to specific curriculum goals, teacher-support materials, etc. Arguably its absence is one of the most widely cited problems when it comes to many ICT4E projects. I think it’s fair to say that both Una Laptop por Niño and Plan Ceibal have recognized the important of such contents and materials and now offer a range of them to pupils and teachers. Particularly Plan Ceibal is using many different approaches to obtain such contents. These include idea competitions, invitations to companies to develop new or adapt existing software and contents, calls for volunteers to translate Khan Academy videos, etc. Una Laptop por Niño seems to have been more focused on contents developed and curated by the Ministry of Education itself. However due to the very limited Internet connectivity their distribution was a significant challenge which was apparently ultimately overcome by distributing USB drives pre-loaded with a collection of such contents. What these experiences indicate to me is that it’s important to come up with a comprehensive approach to survey existing content, involve many different stakeholders in the adaptation of existing and creation of new materials, and subsequently come up with efficient ways to make them available to pupils and teachers. 4. Community inclusion is one area where Plan Ceibal seems to be in quite a unique and exceptionally good position when it comes to 1-to-1 initiatives. Outside of the government-run official project there are now at least half a dozen well established organizations and communities which are closely involved in many related activities. These include the installation of network access in rural parts of Uruguay, the development of open source education software, the involvement of students and faculty of Uruguay’s largest university, the organization of information meetings for parents and all manners of logistical support, etc. It’s many of these seemingly small efforts, which lead to the buy-in of key stakeholders such as parents, teachers, and school administrators. Informally organized groups of people or small organizations can thereby often address specific needs, which can’t be easily met by more traditionally organized entities such as Ministries of Education. As such it is important that these established organizations allow and ideally support community-based participation and involvement in ICT4E projects. Similarly the findings from IDB’s current evaluation report about Peru provide important indications about additional aspects to be aware of, e.g. the high turnover rate of teachers. 6. Evaluation and associated monitoring efforts are in many ways what enable ICT4E projects to address the other five criteria. As such it’s also clear that they mustn’t be an afterthought but rather have to be considered in the earliest planning stages of any implementation. A specific example is the collection of baseline data in order to subsequently form the basis for impact evaluations. IDB’s Una Laptop por Niño evaluation uses the traditional treatment/control groups approach but as Uruguay’s public primary school system has been saturated with laptops this is no longer possible there. In some ways this is probably a good problem to have, however it also makes it harder to separate Plan Ceibal’s impact from other developments in its school system and larger society. Overall there’s no doubt in my mind that there’s much to be learned from these two OLPC implementations. However as indicated earlier it seems to me that not enough is being done to document, evaluate, discuss, and reflect upon what’s happening in the many OLPC, 1-to-1, and other ICT4E projects around the world. Doing this would help in two important ways: Learning how to do things right. And maybe even more importantly: How to avoid making mistakes which others have already made before – what Alan Kay once referred to as “reinventing the flat tire”. 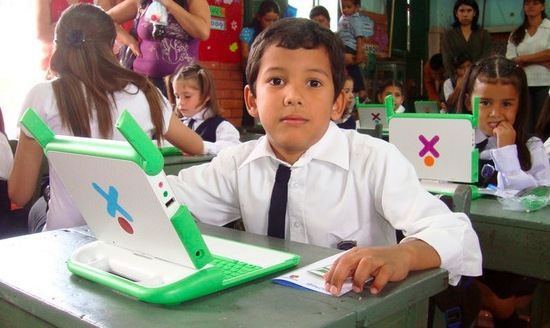 « Where is the Focus of OLPC in Peru and ICT4E in General? 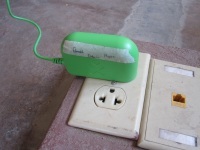 Written by Christoph Derndorfer on March 26, 2012 in OLPC in Peru. Christoph, thank you for starting this Google Doc of ongoing 1:1 deployments. Something like this is much needed! The IDB will be starting a 1:1 project in Honduras this year — we'll add it to the Google Doc as soon as we can. All good points. On evaluation in Uruguay, while I'm not half as familiar with the program as you, I think there are plenty of opportunities still possible – it's just that the baseline is wholly different than what it was before saturation. Now that saturation is the reality, the treatment and control groups can actually go down into the nitty gritty of the variables of XO use and integration at play for each classroom, each school, each district, etc. This could mean finding out which types of community support and continuing professional development programs work best towards achieving program objectives, or also in some cases using the saturated baseline as a means to evaluate and compare various pieces of Sugar against objectives in a carefully designed and controlled experiment. There are really quite a lot of details to explore and delve into further after saturation, for Uruguay and likely for many of the other programs which this great list will identify. Thanks for getting it going! Great idea Christopher, it will be great to have a more complete picture of the one-to-one landscape.